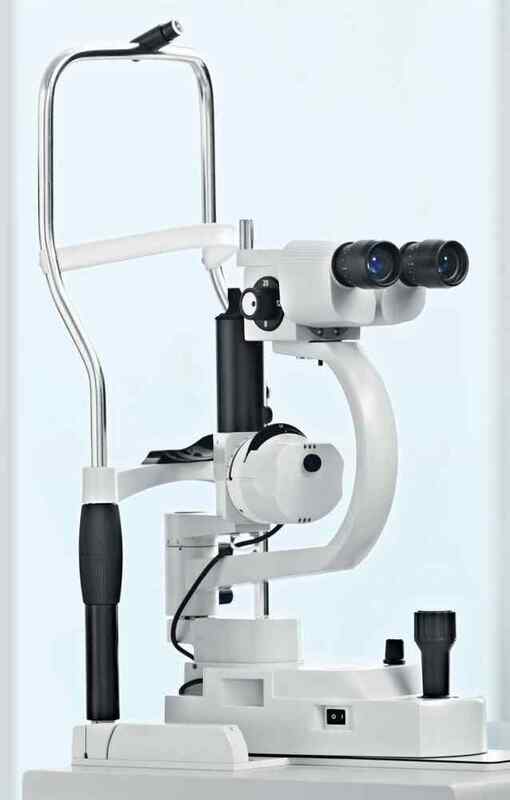 The SL115 Classic slit lamp from Carl Zeiss offers outstanding optical performance and superb ease of use. You can use it to perform all routine examinations and contact lens fitting with the ultimate comfort and convenience. The operating concept of the SL115 Classic is sharply focused on your daily work routines. Its practice oriented design guarantees not only short working distances during therapy, but also maximum comfort for the patient and user. The various possibilities for slit adjustment allow you to use many different illumination techniques. The precision of the slit image permits structured illumination and allows the light to be scattered on even the smallest structures. By rotation, you can adjust the slit to the position of the object of interest. Slit decentration permits contrast enhancement for better detection of even the finest corneal lesions. Filters increase the contrast in red-free observation and fluorescence. A short working distance helps to ensure a comfortable arm and body posture. Generous, unhindered access to the patient’s eye facilitates contact lens fitting and manipulations on the eye. The SL115 Classic is immediately ready for use. Right after unpacking, it can be attached to the instrument table using two screws or adhesive pads. The integrated power unit adjusts automatically to standard international voltages. Simply plug it in – that’s all there is to it. The high transmission of the SL 15 Classic’s optical system means considerably reduced exposure of your patient to light during the examination. The patient’s eye is reliably protected from UV and IR radiation in compliance with ISO 10939. With the SL115 Classic, you receive outstanding performance which you can expand to meet your own personal requirements – and all at an exceptionally affordable price. The AT 020 applanation tonometer allows precise measurement of intraocular pressure. For documentation, you can equip the SL 115 Classic slit lamp with a compact video attachment for the connection of miniature cameras. Optical brilliance without compromise – this is guaranteed by the legendary ZEISS brand. The outstanding features of the SL115 Classic Slit Lamp include its high-contrast resolution and fine, highly precise slit. You benefit from the exceptional image detail, allowing reliable diagnoses and excellent contact lens fitting. A swing-in yellow filter for fluorescence examinations and contact lens fitting is a standard feature of the system. The super high eyepoint eyepieces ensure that eyeglass wearers can also work comfortably and conveniently. The SL115 Classic is ideally suited for contact lens fitting. A large illuminated field allows observation of the entire anterior segment, permitting reliable assessment of soft contact lenses. Looking to buy more than one item? Images displayed on product pages are for illustrative purposes only. Any equipment that is displayed on items such as combi units, for instance, are not included with the product. New products which come complete with items such as chairs, may be subject to a choice of variation options, i.e. chair/colour. Please call to discuss your options. Click the link below and we will email you with our latest offers and news so you always get the very best deals! Pictures shown on this website may be library pictures and not the actual items for sale. Accesories and other items not included in the sale price may also be shown on the pictures, E&OE.